Replace the factory's fixed length rear upper control arms with our heavy duty adjustable set-up! Allows for centering the rear end after lowering and/or adjusting your pinion angle. These are the best choice for serious off road handling. Allows for fore and aft alignment of the rear end for clearance when running larger tires and greatly increases the rear end's stability. The Del-Sphere pivot joints provide for 28 degrees of articulation, perfect for the off road enthusiast looking for maximum suspension articulation! Tech Note: If lowering, these should be used in conjunction with our adjustable rear lower control arms. These do not have connections for the factory's optional "Autoride" air ride suspension. 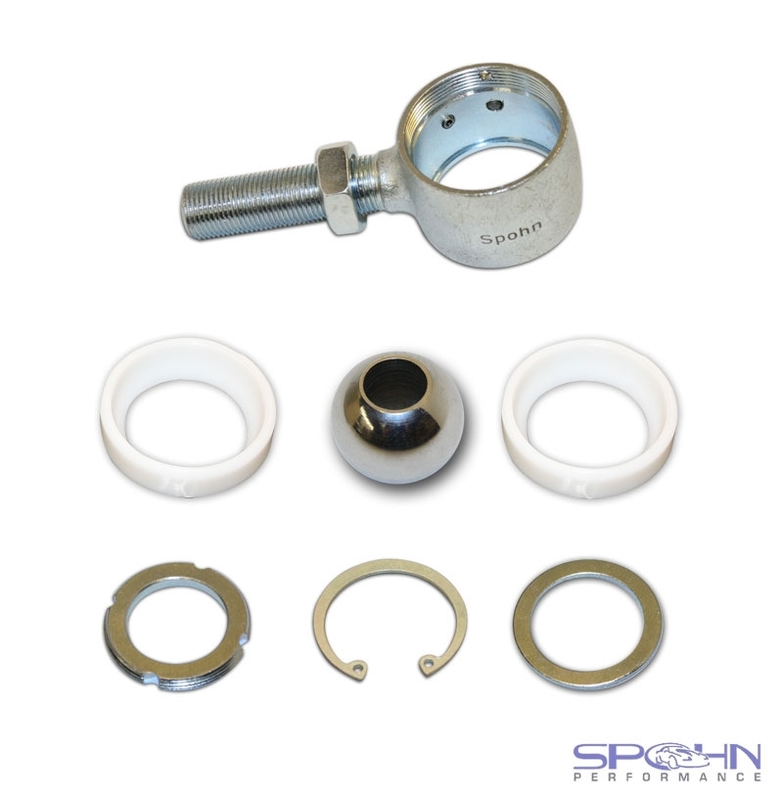 This combination allows the bar to articulate like a spherical rod end (28 degrees of available rotation) during cornering but the spherical ball does not allow the bushing to deflect. Therefore the bar remains completely bind free like a spherical rod end during cornering for predictable traction in the corners. 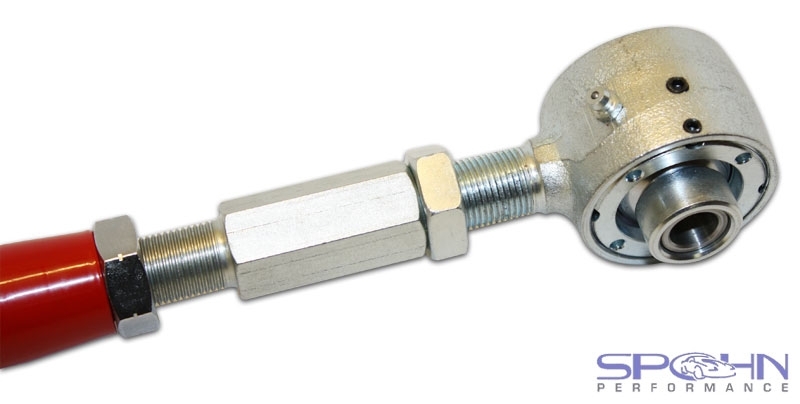 Think of the Del-Sphere pivot joint as a Delrin bushed spherical rod end. After over a year of R&D testing here at Spohn Performance on a streetable spherical joint the Del-Sphere pivot joint is the final result. Designed and manufactured exclusively by Spohn Performance, we have taken street suspension performance to the next level. Our Del-Sphere pivot joint features a one piece forged and heat treated chrome moly housing, a heat treated and chrome plated chrome moly spherical ball, Delrin bushing cups, heat treated retainer washer and snap ring, heat treated and chrome plated chrome moly threaded adjuster ring, an external grease fitting and a beautiful silver zinc plated housing finish. The Delrin bushing cups absorb shock and road noise so you get the quiet and smooth ride of a bushing as well as 28 degrees of rotation! 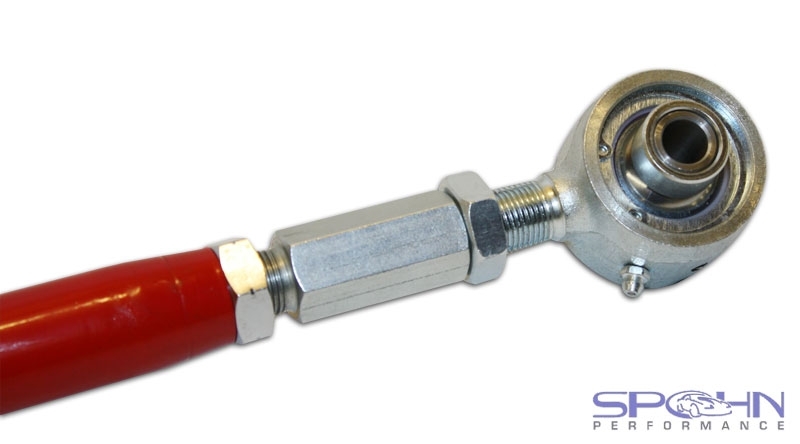 Our Del-Sphere pivot joints will always ship to you fully assembled, however, we also offer an optional adjusting tool that will allow you to do two things. First, you can disassemble the Del-Sphere pivot joint for cleaning, inspection, etc. Second, you can adjust the amount of friction on the spherical ball. Do you want a very low friction pivot joint or a very tight pivot joint? It's up to you, the amount of tension can be easily adjusted by using our optional adjustment tool to tighten or loosen the end retainer ring. What that also means is if over time and miles the tolerances open up you can simply re-adjust the retainer ring and have your pivot joint as tight as it was the day it was brand new. 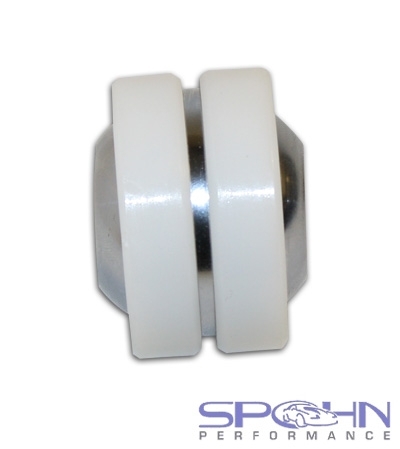 We doubt you'll ever need to replace the Delrin bushing cups, but they certainly can be. 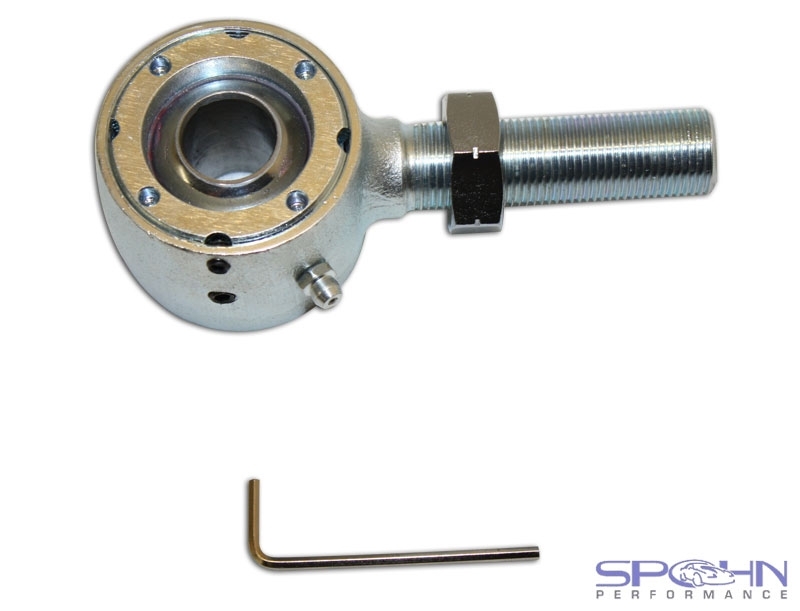 Unlike a spherical rod end, the Del-Sphere pivot joint is 100% rebuildable.